« Free Online Picture Resizer – Crop and Resize photos, images, or pictures online for FREE! Initial hack – image via the forums server. 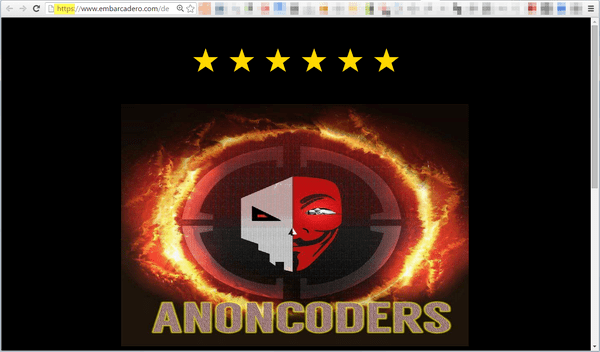 This weekend, the Embarcadero web site was hacked by AnonCoders. Not once (see also [WayBack] G+ link and [WayBack] DelphiPraxis link and [WayBack] image) but at least twice (see also [WayBack] G+ link and [WayBack] image and [WayBack] Delphi Praxis link and [WayBack] image) where the initial hacked simple text “Hacked By AnonCoders ~ Cyber Caliphate” after having been reverted back to the site – hopefully by Embarcadero staff – was replaced with [WayBack] more graphical content later on. Hack presenting itself in the IDE – image via the forums server. The Welcome Page inside the Delphi IDE uses the Embarcadero web site, so the Delphi IDE Welcome Page was also affected (see also [WayBack] this G+ link). Because the IDE uses this on-line content, potentially any code could be executed inside the IDE (apart from that page being loaded over http, so any man-in-the-middle could abuse this, but I digress). This imposes a security risk as many developers run the IDE from accounts having more rights than the average user. At least until Embarcadero responds with a statement about the hacking (when writing this, they still haven’t), it is wise to disable the Welcome page. Note and [WayBack] I’m not the only one urging Embarcadero to post a statement, any statement, even “working on it” will do. I’ve avoided the Embarcadero servers myself for a quite long time because their TLS implementation was (and still is) so bad, so I don’t trust them with my personal information. Now they managed to have [WayBack] https://embarcadero.com redirect to http://www.embarcadero.com as well. Not long ago, there were also issues on the community server (besides it doing login over plain http) with Japanese adverts like this (luckily [Archive.is] they are gone now) up to the point where [WayBack] even Google suspected the site to be hacked (see below) and worse: [WayBack] Google still thinks it might be. Add an underscore to startpageide160.bpl so it becomes _startpageide160.bpl and restart the Delphi IDE: then the Welcome Page is gone. Thanks [WayBack] Uwe Raabe for reminding me of that. 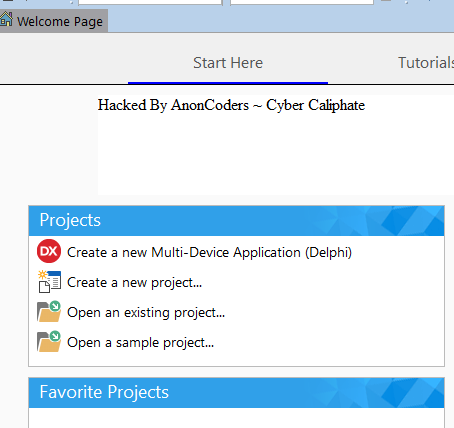 Last year, Daniel Wolf wrote a new Welcome Site plugin for Delphi. His article with instructions to remove the default Welcome page and install the package [WayBack1/WayBack2] Meine Vorstellung einer Willkommens-Seite – IT-Consulting d.wolf is in German so might not have missed it, but the Google Translate: My idea of a welcome page is actually quite OK so it’s worth installing. Install them from the right Delphi (using menu Components, Install Packages..., button Add..., browse for the correct bpl file, click the Open button. After this you can find it under menu View, wuppdi Welcome Page (for Delphi XE8, 10.0 Seattle and 10.1 Berlin) or View, Tool Windows, wuppdi Welcome Page (for Delphi 10.2 Tokyo and up). PS: the Embarcadero forums server loses messages and threads over time, hence quite a few of the links in this article are through saved web.archive.org links. Those links are slow, but at least are retained for much longer than the Embarcadero server does. I’m not surprised. Neither the IT team nor the development team at Embarcadero seem very security aware. QC for instance cannot even use HTTPS to connect to the SOAP server which means your credentials are always sent over the wire in plaintext. The SSL configuration of both their web and mail servers are vulnerable to various attacks. Some of their web sites use plain HTTP for login. The development products only check local things, but not information obtained over the network. App Tethering doesn’t use any form of connection level security (but passwords are salted and hashed). But don’t place anything DLL like in the Delphi bin directory or tamper with anything executable there: it’s either a “quit Delphi now” or “license issue” you will get. I understand their wish to protect against unlicensed Delphi usage, but wish they cared as much for the security of their customers (and recursive customers of their customers) as they cared about the revenue stream. You have to go through their hacked infrastructure to download/install/register their products. Until I see a statement detailing which parts of their infrastructure are safe (including grade B or better TLS), I won’t install their products. It’s not hard to put a proper TLS in front of internal http. [Archive.is] https://pluimers.com does that. Even though it makes little sense, you can even do it for external links: [WayBack] https://pluimers.com/wiert was nothing but a shell around [WayBack] http://wiert.me as an experiment if it would word (as the paid WordPress.com cheaply fails to put the proper domain information [WayBack] https://wiert.me). This server could not prove that it is wiert.me; its security certificate is from*.wordpress.com. This may be caused by a misconfiguration or an attacker intercepting your connection. In the mean time, WordPress.com has switched to LetsEncrypt ([WayBack] HTTPS Everywhere: Encryption for All WordPress.com Sites — The WordPress.com Blog), so the above WordPress issues have been resolved. This entry was posted on 2016/03/14 at 17:49	and is filed under Delphi, Delphi 10 Seattle, Delphi 2005, Delphi 2006, Delphi 2007, Delphi 2009, Delphi 2010, Delphi XE, Delphi XE2, Delphi XE3, Delphi XE4, Delphi XE5, Delphi XE6, Delphi XE7, Delphi XE8, Development, QC, Software Development. You can follow any responses to this entry through the RSS 2.0 feed. You can leave a response, or trackback from your own site. I commented out the Online banner load in the default.htm page in the C:\Program Files (x86)\Embarcadero\Studio\16.0\Welcomepage folder. It shows I am offline, but I still get to see the recent and favorite projects. That’s an interesting trick! Thanks for sharing it. Didn’t try that one yet. Does it work as well? Certainly disabling the IDE package the easiest way, especially with D10Distiller. There are many other IDE packages that you might want to disable. What does trackingsystem do? What’s D10Distiller? 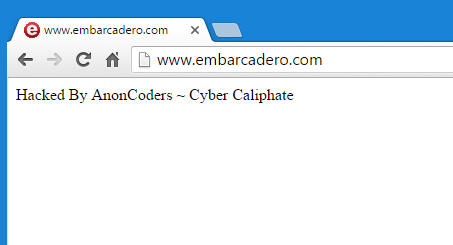 Over the weekend hackers attacked the Embarcadero web site. The hack was confined to the Website CMS front end, which also serves the start page banner. The network was not accessed, and NO customer or internal data was exposed or compromised. The issue was identified and fixed. Thanks for noting nice Welcome Page by Daniel Wolf. and there is even a 10.1 Berlin version now available, although it appears that the Berlin welcome screen no longer has the banners on it, but is still browser based. Also the stock Berlin welcome screen still doesn’t have categories for favorites, so the Daniel Wolf welcome page is a must if you have lots of favorites that need more organization.